Chocolate is a go-to treat for people all around the world, but not all of the brands are healthy or sustainably sourced. In your search for the best chocolate, especially the best organic chocolate, we want to help you find brands with multiple benefits. The best chocolate will have minimal ingredients with no added chemicals, all while giving you a delicious product. One of the best organic chocolate bars we have found is the Alter Eco Americas chocolate bar. It has several benefits that are good for both you and the environment. It is astounding to see all of the benefits that come from supporting a business like Alter Eco. 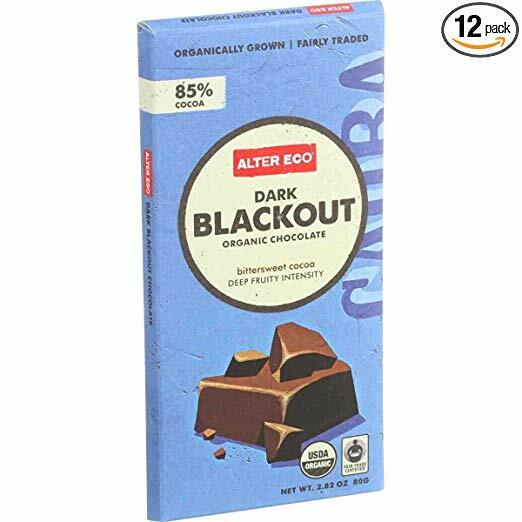 Their dark chocolate bar, called Dark Blackout, has great reviews online and has a great price. In fact, there are only four ingredients in this chocolate bar! On top of that, the company gives back to the environment and supports the farmers that produce their ingredients. On Amazon, this chocolate has a rating of 4.4 stars. We will be taking a closer look to see what makes this product so amazing. If you are going to spend the money on high quality chocolate, it should have high quality ingredients as well. The Alter Eco Dark Blackout organic chocolate bar only contains four ingredients: organic cacao beans, organic cocoa butter, organic raw cane sugar, and organic vanilla beans. As you can see, the company only uses organic ingredients in this product. On top of that, each of these ingredients is also Fair Trade certified by Fair Trade USA. This company believes in organic, sustainable farming because it produces the very best ingredients. They even go so far as to pose this question: “If we don’t nourish your body, mind, and taste buds, what’s the point?” As self-proclaimed foodies, this company promises to do just that with their products. By only using organic ingredients, this company prevents any chemicals or petroleum by-products from entering into your chocolate bar. They also keep their ingredients pure and non-GMO. This ensures that none of their ingredients contain altered genetics but are as pure as you want them to be. By being Fair Trade certified, this also ensures that all of the ingredients come from sustainable farms. They use only the best farming methods that create high quality food and give back to the environment at the same time. With all of this information, it is easy to see that this company offers a great product. Alter Eco uses high quality ingredients in their dark chocolate, but there is so much more to them that is admirable. They are committed to more than just offering a superior product. They also want to take care of the environment and make their practices sustainable. There is more to being Fair Trade certified than eco-friendly farming practices. The company pays a premium so that the farmers receive a fair wage for their crop, which then goes on to support those farmers, their families, and their communities. Around the world, farmers tend to carry debt three times their annual income, but Fair Trade helps them to overcome those debts. This helps farmers around the world to live happy, prosperous lives. By supporting organic farms, this company prevents harmful chemicals from entering the soil and the waterways. Even with this effort, farming the same crop depletes the soil of vital nutrients, which then affects biodiversity. This is why Alter Eco also pursuing the pilot program for Regenerative Organic certification. In a nutshell, this entails using holistic farming practices that gives more to the environment than it takes. The farmers grow a variety of crops as well so that they can use and return a variety of nutrients in the soil. There is more that this company is doing to help the environment, but we will discuss that in the “About This Company” section. Let’s get back to the chocolate. The Alter Eco Dark Blackout organic chocolate bar is available as a single bar, but you can also purchase it in a set of 12 bars. Depending on where you buy a single chocolate bar, you are looking at spending three to five dollars. If you want to buy the set of 12, it is only $41.41 on Amazon, which includes free shipping. If you were to buy the chocolate from the company website, it is $44.28 and most likely does not include free shipping. You can also find this product in a variety of stores, including Whole Foods, Kroger, Publix, Sprouts, and Natural Grocers. We already know that this chocolate contains high quality organic, non-GMO, and Fair Trade ingredients, but here is more for you. This chocolate is also vegan, gluten-free, soy-free, and paleo-friendly. Essentially, this is a guilt-free chocolate bar that you can enjoy at any time. It contains 85 percent cocoa, which is what determines whether chocolate is considered dark or not. The higher the percentage, the more bittersweet the chocolate will be. This is a pretty high percentage, so dark chocolate lovers are sure to love this bar! Now, let’s get back to Alter Eco as a company. Two citizens of France, Mathieu Senard and Edouard Rollet, are obsessed with food and based their company in San Francisco, California 15 years ago. They source their ingredients from several different countries, including Peru, Ecuador, Bolivia, the Dominican Republic, Sri Lanka, India, and Indonesia. They then manufacture the chocolate in Switzerland, using the Swiss method, which does not require alkali. Through the food products they offer, Mat and Ed strive to fight for economic and social justice. This is why they give back to their farmers and to the environment. In fact, one way they are helping the environment is helping to conserve and replant the portion of the Amazon rainforest in Peru. Doing this improved the quality of the farmers’ crops and increased biodiversity. The number of trees they plant every year accounts for over 100 percent of Alter Eco’s carbon expenditures. This is just one way that they give back. Alter Eco is also working on making all of their packaging compostable. Currently, some of their products (their truffle wrappers and quinoa bags) use plant-based packaging that is commercially compostable. None of their packaging is ready for backyard composting yet. This is an ongoing effort for the company so they can cut down on waste and protect the environment even more. Through all the information we have given you, it is easy to see that the Alter Eco Dark Blackout organic chocolate bar is a great product. It contains only organic and non-GMO ingredients and is a guilt-free dessert choice. They only use a handful of ingredients, and each of them is easily recognizable and easy to pronounce. There is nothing questionable in this chocolate bar. Customers say that this kind of chocolate melts in your mouth easily and has a subtle, fruity taste. They also say that it is very smooth and not nearly as bitter as they expected it to be. There really are not any negative reviews for this product. Anyone who did leave a negative review stated that the chocolate arrived in the mail melted, but that has nothing to do with the company. Another negative review claimed they did not like the taste, but the suggestions they gave implied that they were not a fan of dark chocolate. When it comes down to it, the Alter Eco organic dark chocolate bar is one of the best of its kind. Their ingredients are organic, non-GMO, and healthy, so you do not have to worry about any questionable items. They come from farmers that use sustainable farming practices, and this product helps support those farmers. The company has an eco-friendly approach to all of their business practices, so even the company is great. Be sure to try out this dark chocolate! While we think this chocolate bar is great, there are still many more brands and products for you to consider. We made a list of the best organic chocolate available on the market today, so you need to check it out. There are several great brands that provide a delicious product. Out of all the ones we have on our list, we are sure you will find one that you love. Here are some top questions that I found for people seriously considering buying the Alter Eco Americas Organic Chocolate Bar. Why is there white on the chocolate bar? If you receive your product with white on the chocolate, it is still perfectly edible. This happens because the chocolate is sensitive to temperature changes. To prevent this, store it in a cool place away from sunlight. What is the cocoa percentage? The cocoa percentage is 85.